Mom battles pre-eclampsia, cheats death. Remembers her near-death experience. "I felt like I was floating above myself and the baby was beside me," she said. "All I could see was light... The place was silent... I was like 'God, is this death? The baby and I are dead?'" Lekota and Sara Francis with their son Amari. 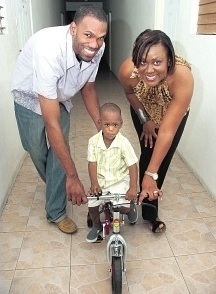 July 29, 2012 Reported in the [jamaicaobserver.com]. Husband’s support critical. When pre-eclampsia visited Sara Francis in 2009, it brought with it a guest — death. She and her baby survived the encounter, but it was a close call. Francis's experience with pre-eclampsia — which has killed 28 Jamaican women in the past five years, according to Ministry of Health statistics — began 23 weeks into her pregnancy. The disorder, which can affect a woman from as early as 20 weeks in gestation, presents as high blood pressure, protein in the urine and, sometimes, swelling caused by fluid in the body's tissues, also referred to as oedema. Francis had gone to the hospital because of stomach pains, which she later learned were contractions. However, soon after the doctors stopped the contractions, the signs of pre-eclampsia became evident. "I started to swell to the point where my wedding ring got stuck on my finger overnight. The doctors had to send for a bone specialist to get it off. The swelling was an early indication of the pre-eclampsia. My blood pressure also went up," Francis, 31, told the Jamaica Observer. "I started to swell rapidly after that. They started me on blood pressure meds and after about two days, it normalised; so I was discharged." Still, her obstetrician/gynaecologist wanted to see her every week. "When we reached about 26 weeks and some days, she [the OBGYN] said my blood pressure was too high and I had gained 10 to 15 pounds in the space of a week, which meant I was retaining water," she said. 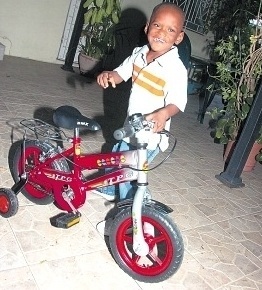 Francis was readmitted to hospital. "They [the doctors] tried giving me meds to lower the blood pressure. It went down a little, but it never normalised. Each day I was swelling more, to the point where I couldn't stand; otherwise, my back would kill me. I also had severe oedema; when you touched me, you could see the impression," the mother recalled. After almost two weeks in hospital the medical team decided it would be best to deliver the baby — the only known cure for pre-eclampsia. "I was rushed to [the operating theatre] for an emergency Caesarean section," she said. "While waiting to go into the operating theatre, I started having contractions so it was evident my baby was coming that day, one way or the other." Things appeared to be going well until the doctors happened upon fibroids in her womb; Francis had had some removed when she was only 22 years old. "When they cut and went in, I heard one doctor say to the other 'If I go this way, she may haemorrhage, and if I go the other way, she may haemorrhage'," recalled the mother, who was awake throughout the procedure. A senior doctor had to be called in, but it was 45 minutes before she arrived, the mother said. The doctor, she noted, had to travel from her private practice elsewhere. The wait was interminable, according to Francis whose husband Lekota was, at the time, waiting outside for her to emerge. "I started to cry while lying on that operating table," Francis said, her voice thick with emotion as she recalled being told that the medical team was awaiting the senior doctor. But even when that doctor arrived it was not smooth sailing. "They had to do not only a bikini cut, but also a vertical cut, so I had two incisions. They had to be moving the organs around, taking what needed to be taken out in order to reach him," Francis said.They finally did. "When they cut the umbilical chord, I heard him scream. The scream sounded like he was about eight pounds," she said. He was far from eight pounds. "I was shocked beyond belief when I saw him. I had never seen a baby that small; he was like the size of a kitten," Francis said. "I remember he was breathing very hard and crying and that he had hair down to his forehead. I asked the paediatrician if he is going to survive, and she said 'Well, we are going to do every thing we can' and then they rushed him away," she reflected. Shortly thereafter, Francis began to feel upper gastric pains — a sign, she said, of what would follow: eclampsia. Eclampsia, which sometimes follows pre-eclampsia, is where a pregnant woman has seizures not related to a pre-existing brain condition. In addition to seizures, other signs of eclampsia, according to MedlinePlus, include muscle aches and pains, severe agitation and unconsciousness. "I remember them shouting 'Her blood pressure is going up!' I started to scream because of the pain. And then the air conditioning had gone out and in there was very hot. One of the anaesthesiologists told me she is going to do something for the pain," Francis recalled. "She did, but I felt like the pain moved from the upper part of my body to where the incision was. Then I really started to scream." Lekota, for his part, thought his wife was going to die. "Her blood pressure was skyrocketing. I could see panic on their [the doctors' and nurses'] faces. I heard one of them say, 'Call the doctor because her blood pressure not going down'," the father, who had by then seen his infant and spent a little time with him at the Neonatal Intensive Care Unit (NICU), told the Sunday Observer. "When I saw their panic, that is when I started to panic. I didn't even want to be there because I was afraid of what was going to happen. But I found a little inner-strength and stayed with her." Eventually, Francis was given some medication that brought the pressure under control. But even as the medical team worked on her, the mother had what she believed to be a near-death experience. "I felt like I was floating above myself and the baby was beside me," she said. "All I could see was light... The place was silent... I was like 'God, is this death? The baby and I are dead?'" "Some people say it is the anaesthesia that caused it, that it wasn't a real experience. But I had been under anaesthesia before and after that experience and I had never had anything like that happen. The fact of the matter is that it felt extremely real and it has affected me in ways that I can't even express," she added. When Francis came back to herself, she noticed the bandages on her body. "They wheeled me out and I saw my husband. I asked him if he saw the baby and he said 'thank you'." It was then that her husband told her it had been some five hours since she had been in theatre. "Years later, he told me he thought I had died and they didn't want to tell him. I came out three hours after the baby did," she said. But Francis' dramatic delivery was only the start of a long and difficult journey. "I felt like I had gone to the deepest, darkest depths of hell. I could barely feel my body, I was barely in touch with my emotions. I felt like I was slipping away," she said. "I felt like I was losing my mind and not in the sense people mean when they are overwhelmed; I literally felt like I was losing my mind." Thanks to her husband and medication, she was able to keep it together for the duration of her stay in hospital, though not before she nearly fell apart after seeing her child — who weighed just over a pound at birth — in the NICU for the first time. "The entire length of his arm, from his shoulder to his wrist, was the size of my middle finger. There were like five different things connected to him and he was so, so tiny. I cried; they had to rush me back to my ward out of fear that my blood pressure would skyrocket," Francis recalled. "I was crying and hysterical. They allowed my husband to stay outside of the visiting hours so that he could comfort me. I spent seven days on the ward and it was difficult seeing people with their healthy babies," she added. Up to this point, Francis felt it was her fault the baby had been born premature which saddened her husband. "It made me feel sad. But at the same time, I had to be strong for the two of them and try to reassure her that it is not her fault," he said. Francis was eventually discharged — without her baby, who had been named Amari, meaning 'gift from God'. The infant spent three months in the NICU — months that were stressful for the couple. "There were times when we thought we would have lost him. He stopped breathing and turned blue a couple times," she recalled. "There were times that were particularly horrible, like when he had the stomach infection... He became so fragile that he started to tear, his skin started to tear... It was a difficult, difficult experience. There were times when you simply didn't know. But I have to give thanks to the doctors and nurses on the NICU. They took superb care of him and I have to really ask God to bless them," Francis said. She credits her husband, who she affectionately calls 'Lek', for getting them through the experience. "My husband was the rock that held us all together because I was literally a basket case. He was the in-between, holding me up while taking care of the baby. During that period and since, he has been an excellent father and he always believed that he [the baby] would make it. He never once doubted that he would," Francis said. Their faith was also critical. "Without our faith in God, I don't know what would have happened to either one of us. He literally carried us; this was literally a 'one set of footprints in the sand' kind of experience," she said. They were soon able to bring their little bundle home, but they were wracked with anxiety. "There was nothing really exciting about it. It is not like people who go home with their bouncing baby and have family come over," Lekota said. "We had to keep him away from all the germs we could keep him from. If people came to look for him, they would have to come in small groups, like no more than three — and that was not until after he had been home for a while." They also had to deal with the reality of their baby taking longer to reach development targets than other babies. Fast forward three years and Francis and her husband have a healthy little boy who — with the exception of the occasional seizure for which he is being monitored by a neurologist, and his failure to speak more than a few words to date — enjoys cycling, being read to and watching television. "He is doing better than expected. For example, his prolonged exposure to oxygen assistance could have impaired his hearing and sight, but he is both hearing and seeing well," Francis said. "The times that he turned blue and there was no oxygen going through his brain, we were told could have left him with cerebral palsy, which he has not had. So his story is not only that he has survived, but how well he has survived," she added proudly. Asked whether they will have other children, Francis says no, not unless it is by way of adoption. "Having gone through such a traumatic experience, I came out with the one child and I am okay with the one. It is an illness that can take your life and the child's life. I honestly thought I could have died, both of us could have died. Why would I want to go to God again as if I am greedy?" she said. "I couldn't put my wife through that again. What we went through is not something I would wish on anybody, not even my worst enemy — and not just for us as parents, but for him as well," Lekota added. Francis, meanwhile, urges women who are pregnant to get in the know about pre-eclampsia. "They should really understand their body and be in tune with it because things will start happening slowly which are possible manifestations of pre-eclampsia. They must also ensure they get antenatal care so their doctor can monitor them properly," she said. "But most of all, enjoy every step of the pregnancy and make sure you have God in the mix." To fathers, Lekota said: "You have to be patient, especially with the mother because she is the person who all of this is happening to. You also have to pray and hope that everything happens in your favour.